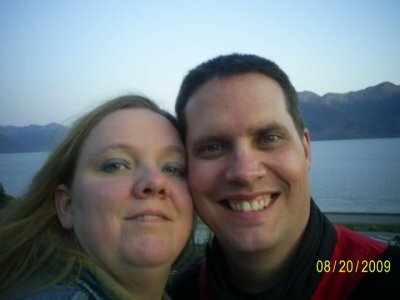 We are a small breeder located in the Great state of Alaska. 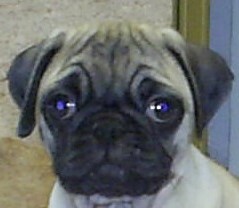 We are striving to breed the best silvers, brindle and fawn pugs in Alaska. Our dogs are our babies and a part of our family. Feel free to look around and meet the crew. one Day My Husband Got me Swaggy P.
Then I had to have another so we got the Little Brindle Fancy P.
DO you see the Pattern Forming?? SO The Next is a Little White Girl I Think I’ll Go with Sassy P.
Now I know you see the pattern now. 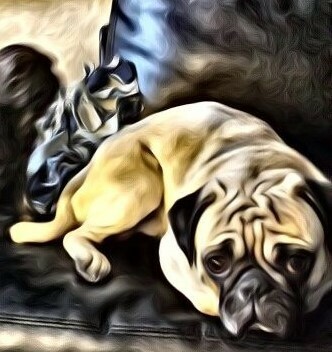 When you get a pug you are in for a handful they are bundles of energy with Little down time. They Love to chew so keeps your favorite sneakers out of sight. Oh And Let’s not forgets the television remotes. And Lord Forbid you forget your Glasses on the table. They will greet you at the door with lots of kisses. And want to snuggle on your lap as soon as you sit down. They will leave their fur all over everything. But all in all We wouldn’t have it any other way..
short-muzzled face and curled tail. most often fawn or black, and a compact square body with well-developed muscles. Pugs can be stubborn and difficult to housebreak. Crate training is recommended. Pugs can't tolerate high heat and humidity because of a short muzzle (air cools down when it passes through the noses of dogs with longer muzzles before entering the lungs). When your Pug is outdoors, watch him carefully for signs of overheating. Pugs are definitely housedogs and should not be kept outdoors. Pugs are greedy eaters and will overeat if given the chance. Since they gain weight easily, they can quickly become obese if food intake isn't monitored carefully. Pug enthusiasts are a fun-loving bunch. They love Pug get-togethers, Pug parades, and dressing up their Pugs. 3. They are brachycephalic – Here is a new word for you to learn. It just basically means that the head is broad but short which results in the smashed face appearance that pugs are well known for. 10. Pugs were the chosen symbol for the Order of the Pug – Order of the pug was a Freemasonry lodge that was formed after the Catholic Church banned Freemasonry. Apparently they picked for their symbol because these dogs are considered to be loyal and trustworthy. 11. Pugs are considered to be a toy breed – Since these little guys are so small in size compared most of the other dog breeds, they are classified as a toy breed. 12. Their wrinkly faces need to be cleaned regularly – Although those wrinkly faces are really adorable, they do require a bit of maintenance. You have to clean between the wrinkles regularly to prevent infection and bacterial growth. The Pug's comical face, with deep wrinkles around big, dark eyes and a flat round face, can't help but make you smile. It is believed that the Pug's name comes from the Latin word for "fist" because his face resembles a human fist. Pugs are clowns at heart, but they carry themselves with dignity. Pugs are playful dogs, ready and able for games, but they are also lovers, and must be close to their humans. Pugs love to be the center of attention, and are heartsick if ignored. Pugs are square and thickset, usually weighing no more than 20 pounds. Their heads are large and round, with large, round eyes. They have deep and distinct wrinkles on their faces. Legend has it that the Chinese, who mastered the breeding of this dog, prized these wrinkles because they resembled good luck symbols in their language. Especially prized were dogs with wrinkles that seemed to form the letters for the word "prince" in Chinese. The moles on a Pug's cheeks are called "beauty spots." His muzzle or mask is black, with a clearly defined "thumb mark" on the forehead and a black trace down the center of the back. His ears are smooth, black and velvety. He has a characteristic undershot jaw (the lower teeth extend slightly beyond the upper teeth) and a tightly curled tail. Personality-wise, Pugs are happy and affectionate, loyal and charming, playful and mischievous. They are very intelligent, however, they can be willful, which makes training challenging.